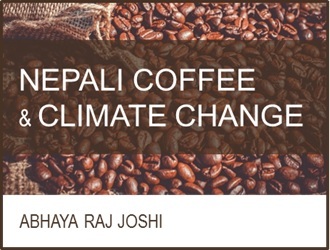 Can Nepali Coffee Survive The Impacts Of Climate Change? This article was originally published on The Third Pole website on 10 January 2018. Click here to read the original article. Ramesh Adhikari’s home in Jaisithok, Kavre, a hilly settlement around 60 kilometres east of Kathmandu, was razed to the ground during the 2015 earthquake. While Adhikari is rebuilding after the natural disaster, there is another calamity, this time man-made, that he is worried about. Adhikari is one of the 32,000 Nepali coffee growers spread in 40 hilly districts of the country who produce around 450 tonnes of the ‘wonder crop’ every year, more than 70% of which is exported. According to the Nepal Tea and Coffee Development Board, cool climatic conditions in Nepal are highly suitable for the planting and production of mountain coffee. Official figures show that coffee is currently grown on 2,381 hectares (23.81 square kilometres) of land, just a fraction of the 1,190,769 hectares (11,907.69 square kilometres) considered suitable for the crop. What is happening at Adhikari’s farm and that of other farmers threatens not just to put brakes on the expansion of the industry, but to wipe out the crop that has lied thousands of farmers out of poverty in the past decade. The threat has a name: the white stem borer (Xylotrechus quadripes). But neither the Adhikaris nor their neighbours, who are enjoying a cash crop boom are centuries of subsistence agriculture, know that the real problem has a different name and it is related to decisions being taken thousands of miles away in Bonn or Paris. Recent investigations into coffee and climate change have indicated that as global temperatures rise and climatic variables change, growers in Nepal’s hills are faced with a double whammy: areas where the crop has flourished will not be suitable for future plantations, existing plantations are at risk of being consumed by pests. “There was a time when I sold over 450 kilogrammes of coffee beans a year,” said Adhikari, one of the first farmers to commercially grow the Himalayan Arabica variety in Jaisithok. His initial success inspired many of his neighbours to take up coffee farming often without the know-how. “Now I hardly sell 100 kilogrammes a year, although the price I get has doubled to around NPR 100 (USD 1) per kilogramme. It’s mainly due to this,” he signalled to a white stem borer-infested branch he is dissecting. “Even those plants that have not been affected have lower yields,” he said. Coffee white stem borer is a major pest whose different varieties have affected farms in Asia and Africa. The pest has also been found in American countries. According to Raghupati Chaudhary, Deputy Executive Director at the Nepal Tea and Coffee Board, the first signs of infestation in Nepal were seen around 1998. By 2016, the infestation had become an epidemic in Gulmi, the coffee hub of Western Nepal. In a survey of 68 coffee growers in Gulmi, 72% of the respondents mentioned that coffee white stem borer was a major problem and reported annual yield loss from infested plantations as high as 60%. Similar numbers have been reported elsewhere. Chaudhary believes that due to the infestation, at least 25% of the potential annual yield has been lost. “Ours was one of the first farms in Kavre where infestation was seen,” said 60-year-old Govinda Prasad Timalsina, who also started growing coffee two decades ago. Birdosh Lama, who is the head of a local cooperative of coffee growers in Jaisithok, also had a similar experience of declining yields. “The spread of white stem borer must be linked with the moisture available in the soil,” he added. What Adhikari, Timalsena and Lama are experiencing may not be solely attributed to climate change. But there is a strong case that climate shocks are the primary reason, said Loknath Aryal, a technical officer with the Nepal Agriculture Research Council technical officer. He is testing organic remedies to fight the white stem borer. 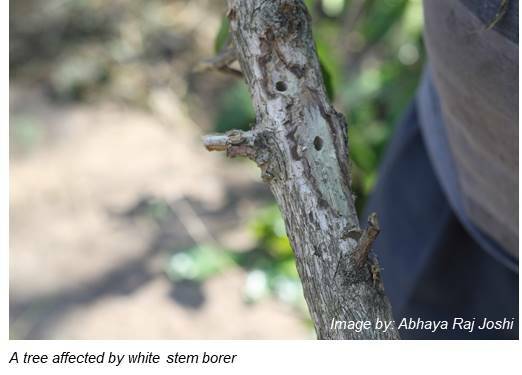 Researchers in Zimbabwe and India have found links between the infestation of white stem borers and precipitation patterns. Most researchers agree that heavy rainfall followed by a long dry spell creates suitable conditions for different varieties of insects, including the white stem borers to breed and to multiply, explained Aryal. The conditions seem to be just right for the pest in Nepal’s hills. Reports such as the Water Resource of Nepal in the Context of Climate Change suggest that while the total annual rainfall has fluctuated little in Nepal, more rainfall is taking place over fewer days. This changing precipitation pattern means that the post and pre-monsoon drought period is becoming longer, leading to sunnier days, suitable for pests to spread. Meanwhile, the second threat coffee growers are faced with is the shifting of agroclimatic zones, attributed to climate change. Recent research conducted at Kunming University suggests that as global temperatures rise, the future climate is not going to be favourable for coffee in Nepal’s hills. According to the report, up to 72% of the area suitable for coffee growth may be lost. Although so much change is taking place in their own backyard, coffee growers like Adhikari have little knowledge about climate-smart agricultural practices. “All we know is that we need to provide more shade to the coffee plants and we can’t use chemical pesticides as our coffee is marketed as organic,” he said. Through experience, he has understood that east-facing slopes produce the best coffee plants as they receive the much-needed morning sunlight. He has also understood that infestation rates are low among coffee plants grown in heavily shaded areas. Aryal said that research has also drawn similar conclusions, and believes such practices need to be adopted on a large scale to control the spread of the pest. “But all that my neighbours see is the lucrative price on offer. They do not care about the technicalities and that increases the risk,” he adds. The Kunming University study suggested that bananas be intercropped with coffee as an increase in temperatures in the hills creates suitable conditions for bananas. Banana plants provide much-needed shade which can lower temperatures in the plantation by up to 2 degrees Celsius. But there’s another pest, the ‘red stem borer’ that’s eating away the banana trees.